Who's going to win it all this season? Our experts make their annual selections. The MLB postseason has arrived. What team will be left standing in a few weeks? 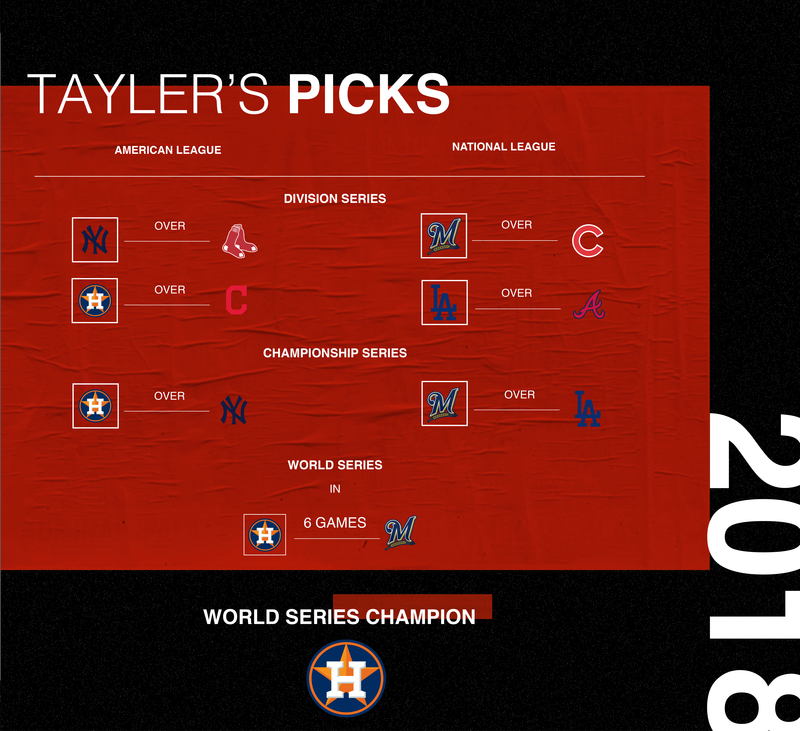 Will it be the Astros repeating or can the Red Sox or Yankees take their American League crown? In the National League, will Los Angeles get back to the Fall Classic and seal the deal this time? Or will clubs like the Brewers, A's or Braves shock us all and make a magical run through October? 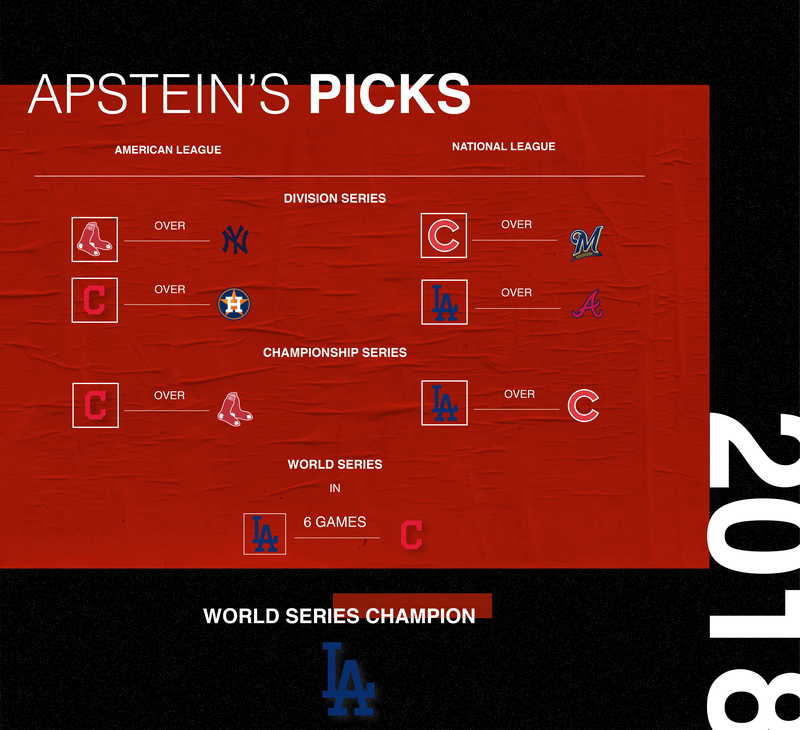 Here's what our experts think as the 2018 playoffs get under way. Prediction: Brewers over Indians in 7. Milwaukee is not just hot (winning eight in a row), it also is built for October. It is the best defensive team left standing and has power and athleticism, a balance of position players to combat matchup bullpens, and a deep bullpen with swing-and-miss stuff. This is the modern game: starting pitchers go twice around the lineup, and then it’s keep-the-ball-out-of-play time with a parade of relievers. And they have the new Carl Yastrezemski, Christian Yelich. Bold prediction: Josh Donaldson is the Justin Verlander of the postseason. The Cleveland third baseman is an 11th-hour pickup who looks healthy enough to ride the change of scenery and the spotlight of postseason baseball to a difference-making run. Prediction: Yankees over Dodgers 6. 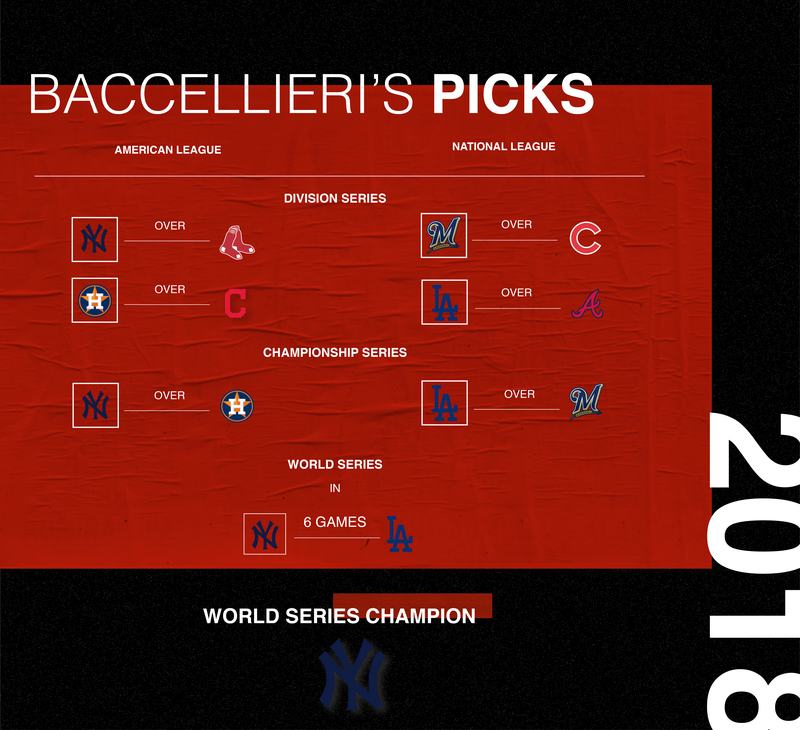 The Yankees may not have been able to take the AL East, but their superior bullpen gives them a shot to beat the Red Sox in the ALDS, and from there, they have everything necessary to go all the way. The roster is deep, they can outslug anyone, and their relief corps led baseball in strikeouts. 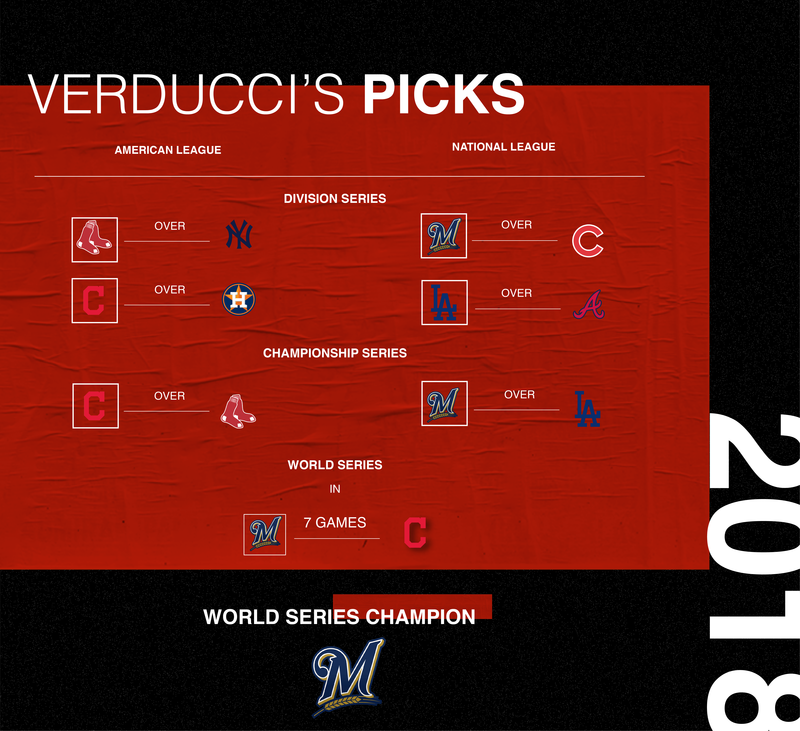 After spending much of the second half torn up by injuries, they're entering the postseason at just about full strength, and that just might be enough to take them to a 28th World Series title. Prediction: Astros over Brewers in 6. 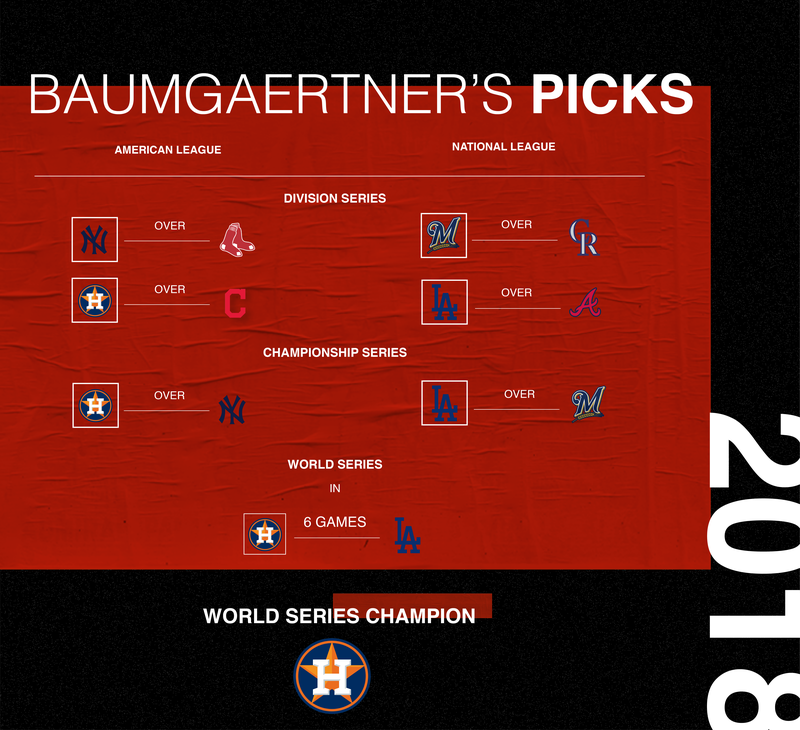 It’s boring to call for a repeat, but I see no reason to bet against an Astros team that looked just as good this year as it did last year. Houston’s Pythagorean record—based off runs scored and run allowed—was 109–53, with a staggering run differential of +265. The lineup is terrifying, the rotation is one of baseball’s best, and the bullpen is deep and tough. This franchise is a dynasty in the making. Bold Prediction: Boston goes down early. With a not-quite-100% Chris Sale and a shaky bullpen, it’s hard to see how the Red Sox will be able to keep runs off the board against either the Yankees or the A’s, both of whom swat homers in bunches. Boston isn’t quite a paper tiger, but despite winning 108 games, it doesn’t feel like this team is long for October with its compromised pitching staff. 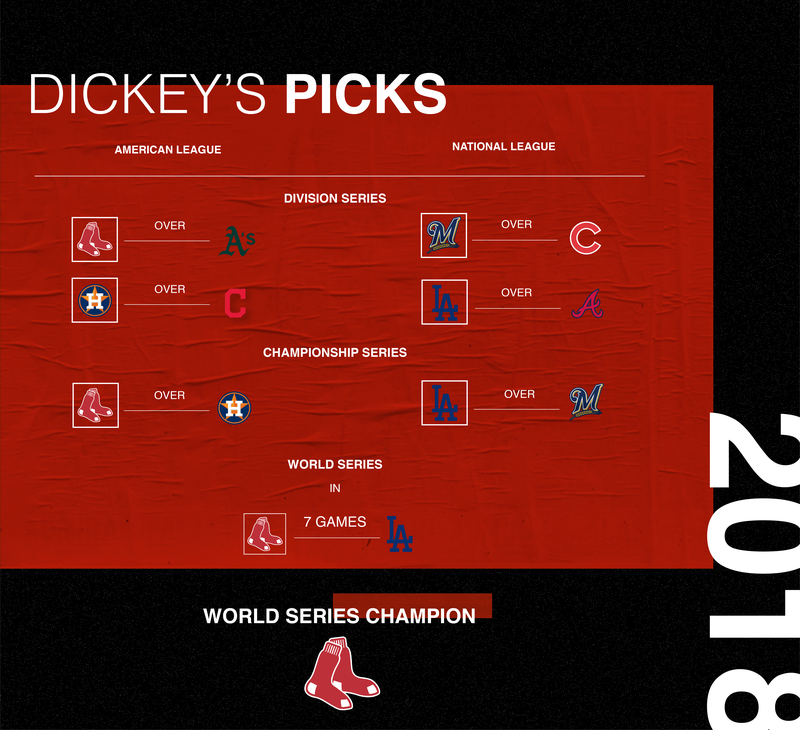 Prediction: Red Sox over Dodgers in 7. What L.A. and Boston share is power from both sides of the plate (each team had its league’s highest slugging percentage), the ability to get on base (the Dodgers’ team OBP, .333, was third in baseball; the Red Sox, at .339, were first), bullpens on which you might not want to bet your rent money, and a history of recent postseason disappointment. It comes down to the rotations then, and I’d give Boston’s the slight edge, prior playoff struggles aside. It’ll be close, though. Bold prediction: Despite the Rays-inspired “opener” trend, the playoffs, wild card games aside, will feature relatively traditional pitcher-usage patterns. (I have no faith in Craig Counsell, whose team would benefit from the opener, to be so bold in his first October as a manager.) That said, this will be the last postseason for a while not characterized by such bullpen shenanigans. World Series: Astros over Dodgers in 6. 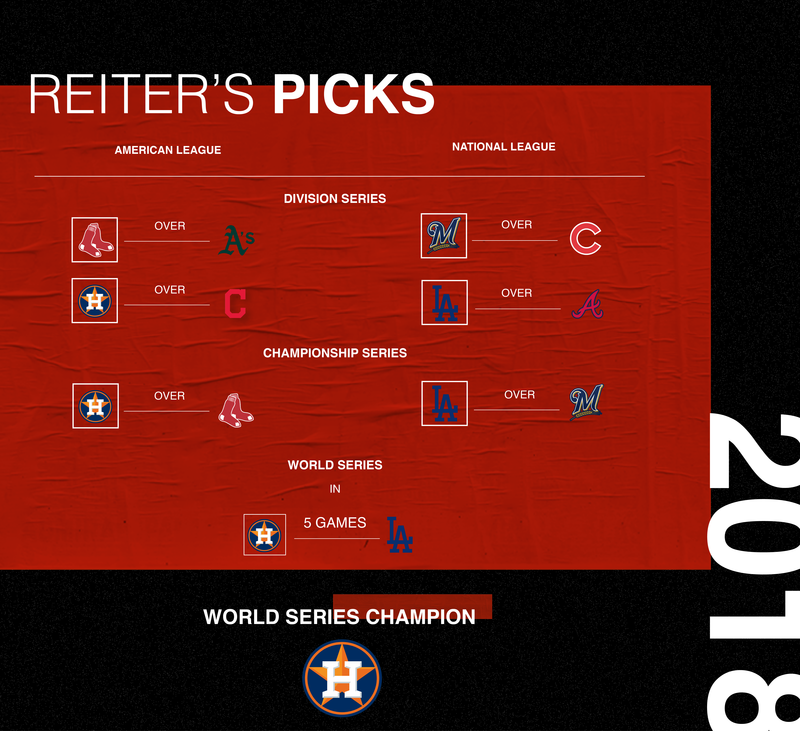 Repeating is no easy task, but if the Astros get reasonable production from the struggling Carlos Correa, this is a better team than the one that won the World Series last year. With Roberto Osuna added to the bullpen and five capable playoff starters (Lance McCullers may end up working out of the bullpen), this team doesn’t have a weak spot. The Red Sox may have the best record, but no team is equipped to beat Houston four times in seven games. Bold prediction: After a horrendous year of poor hitting and injuries, Gary Sanchez is the best hitter for the Yankees throughout the playoffs. Prediction: Brewers over A's in 5. This is not what baseball wants, but this is what baseball will get: Bullpens, bullpens, bullpens. Ready for the "opener" phenomenon to reach the Fall Classic? The A's and Brewers will each ride their elite relief corps. to a World Series that will almost certainly draw record-low ratings. Don't let that detract from the "star" power we'd see in this series from NL MVP hopefuls Christian Yelich and Lorenzo Cain, not to mention Oakland's powerful duo of Khris Davis and Matt Chapman. This would be an outright bizarre matchup, yet entirely emblematic of the state of baseball in 2018. Bold prediction: At least three different games this postseason will be started by relief pitchers. This really isn't an outrageous claim given the success of the "opener" experiment and the fact that the best pitchers on both the A's and Brewers reside in the bullpen. If I can sneak in a bonus prediction, with the caveat that Oakland makes a run to the World Series: Khris Davis will set a new postseason record by hitting nine or more home runs in the playoffs. Prediction: Astros over Cubs in 5. The Astros are the most complete team in the postseason, and that will shine through this month, particularly on the loaded AL side of the bracket. I think the Astros and Indians are the two teams best equipped for the postseason, and whichever team wins that series will win the AL. I look at a team that can run out Justin Verlander, Gerrit Cole, Charlie Morton and Dallas Keuchel for every start of the postseason, a patient, powerful, playoff-tested lineup with multiple MVP-caliber players, and an already strong bullpen that just got longer with the addition of Lance McCullers, and I see the best team in the league. The Astros will be our first repeat World Series Champions since the 1998-2000 Yankees. Prediction: Dodgers over Indians in 6. It’s been a weird year for the Dodgers: The best team in the National League by run differential didn’t know for sure until the last week of the season that it would even make the playoffs. But L.A. is here now, and a roster not substantially diminished from last year’s has a good shot to finish what it came within a game of doing. No one can match the upside of the Dodgers’ top two starters, Clayton Kershaw and Walker Buehler, and if closer Kanley Jansen can steady the bullpen, the offense should be able to do enough. Bold prediction: Joe Maddon loses a game for the Cubs. Maddon is a brilliant manager of personalities, but his in-game moves can be confusing at times, especially when it comes to the bullpen. 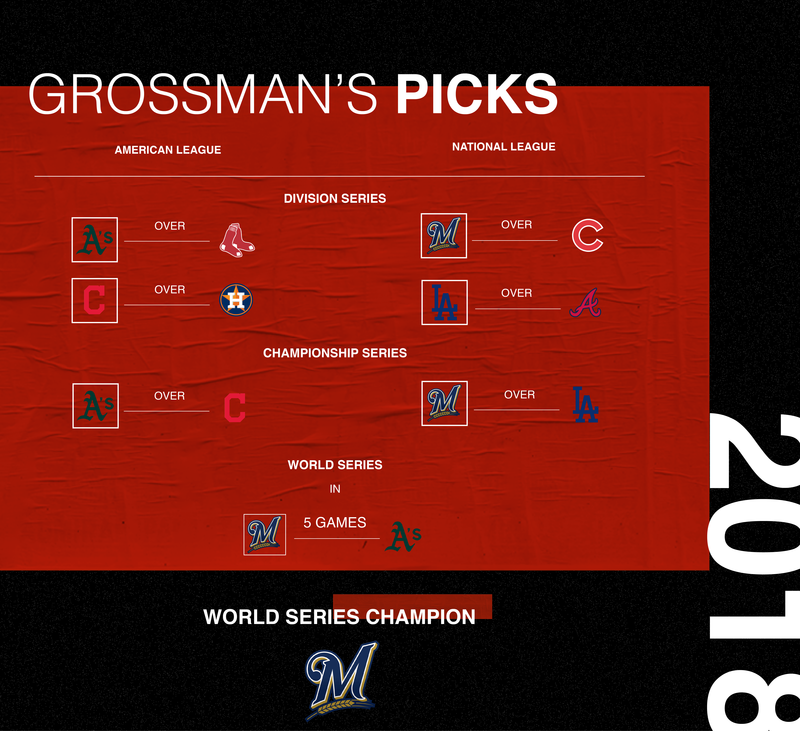 Most famously in 2016, he used closer Aroldis Chapman for four outs in a Game 6 Chicago was winning 7–2; the next night Chapman gave up a game-tying home run. Maddon’s players often let him off the hook—the Cubs, of course, won that game—but eventually he will cause a problem too great for them to erase. Prediction: Astros over Dodgers in 5. This has nothing to do with any past prediction, or even with a currently active prediction that was made, perhaps prematurely, immediately after an old one came true. It has to do with what is happening right now. And right now, the Astros might be one of the best baseball teams in several generations. Rany Jayzerli has pointed out that Houston just completed the regular season with the second-best run ratio–that’s runs scored divided by runs allowed–since World War II. Their lineup wasn’t fully healthy for much of the year. Now it is. 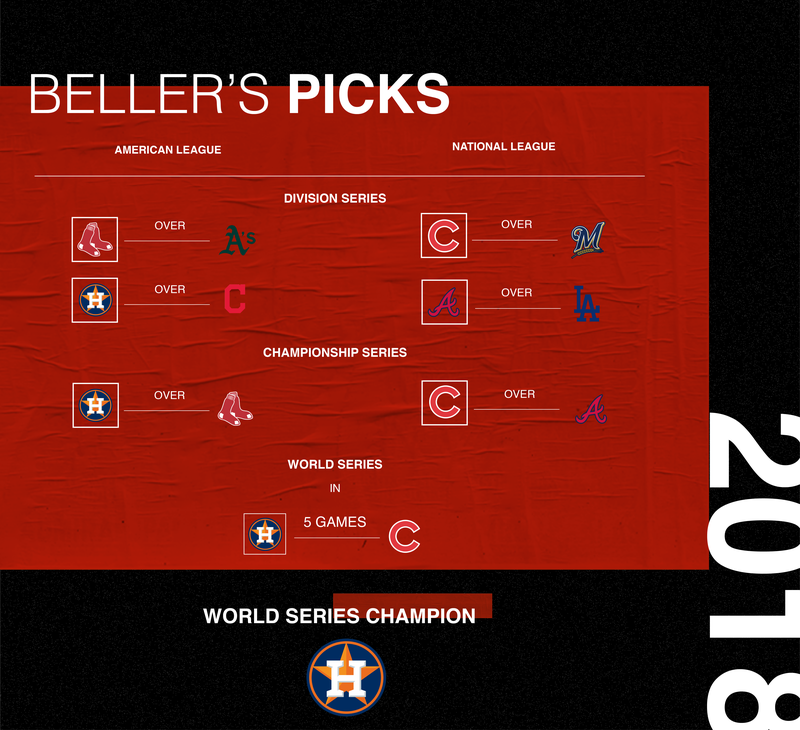 With Gerrit Cole in the rotation, and a host of new fireballing relievers that have fixed their biggest flaw, this year’s Astros are much better than last year’s. And the Dodgers, whom they beat in seven games last fall, are a little worse. Bold prediction: Tyler White will lead the postseason in RBIs. The 27-year-old, former 33rd rounder was in Triple-A until June. In 66 games since then, he has an .888 OPS with 12 home runs and 44 RBIs, which project to 29 and 103 over the course of a full season. He and Alex Bregman carried the offense while Jose Altuve, Carlos Correa and George Springer struggled with injuries. He’ll continue to do so, now that they’re back on the game’s biggest stage.